In case you were off the planet yesterday, Hillary Rosen — reportedly a DNC adviser — dissed Ann Romney (and millions of stay-at-home moms) that Mrs. Romney — a mother of 5 and cancer survivor — has no cred re: economic issues because she “hasn’t worked a day in her life”. Oops … stepped in it. The Romney campaign’s quick reaction to Rosen’s comments — Ann Romney Twitter feed, Fox News hit, conference call — speak to an operation that is ready for the minute-by-minute battle that is modern presidential campaigning. Romney’s operation won a measure of respect for their handling of the slipup by Rosen. 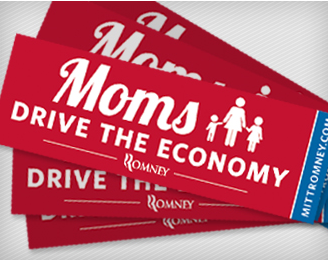 Already there’s a Romney bumper sticker available for sale. Below is our original post from January 2012 … way before it’s time. There are still rumbles that some candidate (think Ron Paul) might run as a 3rd party candidate. The conventional pundit wisdom is that a 3rd party candidate who splits off from the GOP would simply siphon off GOP votes and seal Obama’s re-election. I have another scenario to offer up. What if Ron Paul ran on a 3rd party ticket and was able to win one or more swing states? Sounds crazy, but think Wisconsin, Colorado and New Hampshire … ‘wildcard’ swing states with large college populations. Keep in mind that Paul has enthusiastic support among college kids and young adults … partly driven by his staunch anti-war philosophies, his reverence for the Constitution and his unshakable candor. To that point, it’s being reported that — based on exit polls — Ron Paul won over half of the votes of those under 30 in the New Hampshire contest. Imagine that Paul wins enough electoral delegates to keep Obama or, say, Romney from reaching the magic number – 270 electoral votes. So, the Congressional arm that Obama keeps ranting about could be the body that ultimately determines whether he’ll be living in DC or Chicago after the election. Wouldn’t that ironic twist be fun to watch ? My bet is that it’ll be Romney-Rubio, but, there’s an interesting piece in the Washington Times that positions Condi Rice for the VP slot. Hillary will replace Biden as Obama’s running mate to give Obama an uplift and position her for 2016.The Times says insiders claim “the swap” is what induced her to join the Obama team as Secretary of State. Having Rice on the GOP ticket would change the dynamics of the race since she’s smart, a good debater and, oh yes, an African-American woman. Rice is reportedly antsy in her current professorial position and wants to get back in the action. Interesting … but my money is still on Romnet-Rubio … GOP needs some charisma, and Rubio has it. 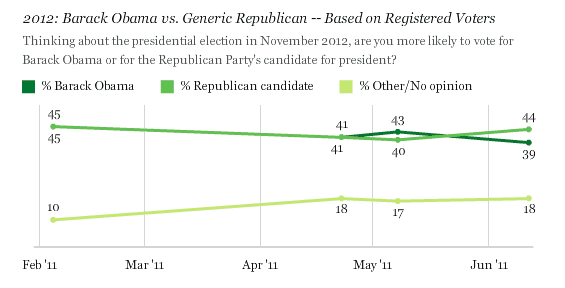 According to Gallup’s most recent polling, a “generic” GOP candidate would beat President Obama by 5 points – 44% to 39%. Ken’s Take: The GOP debate strategy – pick on Obama’s policies rather than each other – might just take a toll on the President. If the candidates stay committed to somebody beating Obama rather than “me” winning, the President will be facing a 18 months of substantial drip-drip-drip. But, I doubt the candidates will stay on message. Eventually, some of the candidates will revert to an “elect me” strategy.